Start of Vast Lake Front Project. Pictures and illustrating the Chicago plan commission’s project for, a great terminal on the lake front at Randolph street will be found in the rotogravure section of The Tribune tomorrow. The Chicago plan commission, through its chairman, James Simpson, presents today to the community and for the particular consideration of all, citizens, officials and interests directly affected, a New Year’s plan of downtown lake front which, Mir. Simpson says, offers about $12,000,000 in work for the unemployed, solves an old and vexing problem and provides a stimulus to business generally in Chicago. 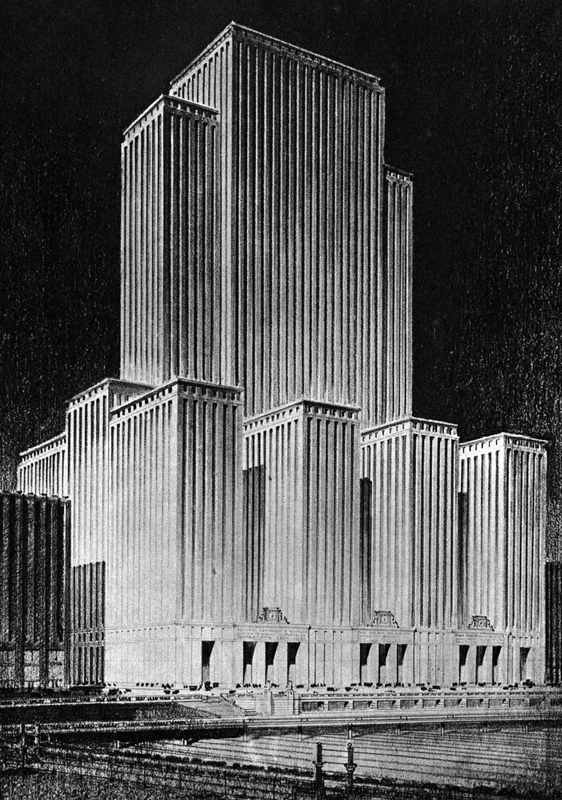 THE CHIEF UNIT in the Chicago Plan Commission’s project for the development of the area between Michigan avenue on the west, the Outer Drive on the east, Wacker Drive on the north and Randolph street on the south is this fifty-story union passenger station, designed by Ernest R. Graham to house the terminal facilities of all the fifteen railroads now using south side terminals. This drawing shows the Randolph street facade of the terminal building, construction of which is intended to inaugurate a twenty-five year plan of development of the entire area now gi ven over to tracks, freight houses and coal dumps. The edifice, says Mr. Graham, will cost $16,200,000 to build on an area of two blocks of land the value of which is estimated at an additional cost of $10,000,000, but not one cent of this is to come from the public treasury, nor will there be any addition to the people’s taxes. Constructed by the Illinois Central railroad, the office space in the building is planned to accommodate also the offices of the other railroad companies using the terminals’ facilities. These now occupy 1,500,000 square feet of space scattered all over Chicago. The tracks leading to the proposed terminal will be two levels below the street, the lower level of the two-decked street above them being used, in the station itself, by the traveling public. This suggestion, In brief, is the construction of a $26,000,000 union railway passenger terminal, fronting on street a short distance east of Michigan avenue, as a permanent home for all the 15 south side railroads. True to the spirit the creator or the original Chicago plan, the elder Daniel Burnham, this new and revised feature has “the magic to stir men’s blood.” It is a big plan, the beginning only, to Ernest R. Graham, and member of the plan commission, of a 25 year development along East Randolph street and the adjacent territory. The coal piles, the wilderness of tracks and old freight sheds of that neglected 100 acres on the lake front, are to spring to stony attention. The sparks from the noisy old locomotives are to become still lights in the towers of a mighty concourse of American skyscrapers. There is to be a new loop there, a new skyline of beauty and utility, connected with the old by elevated boulevards and by an underground structure of streets, shops and parking places which will dwarf similar efforts in New York and London. It will be a new city of air rights and surface rights, built to connect with the new Outer drive and the proposed extension of Wacker drive eastward. A DIAGRAM OF THE STATION APPROACHES AND TERMINAL FACILITIES-This drawing shows Michigan avenue at the left of the picture, Randolph Street, double-decked, running diagonally through the foreground, with part of Lake street extended in the background. Adjoining Michigan avenue is the proposed double-decked subterranean parking area which will accommodate 4,000 automobiles. To the reader’s right of this are the suburban railroad trackage and the expresa tracks. In the right middle ground is a cutaway diagram of the terminal itself, in which the concourse, baggage rooms and other area devoted to the use of pallengers appear one level below the street, and one level above the tracks. Financially, it is easy; economically, it is here. It presents economy of operation for the railroads without expenditure of any more money per car than at present. The basis is found in the 1,500,000 square feet of space required by the roads, now spread all over Chicago. For the new terminal building itself, the plans call for an area, of two blocks, or 175.000 square feet. It Would be a strong, simple stone structure rising from the Randolph street viaduct now being built. The plans call for a tower of 50 floors and. a building larger than any ollice building In Chicago. With the expanding requirements of tenants there could be provided over 2,000.000 square feet of floor space, well within the requirements of the building ordinances. “The time is coming soon when we will be able to realize this and much More,” aid Mr. Simpson, in discussing the terminal plans. 1. Of the estimated cost of this suggested new passenger terminal, nearly $12,000,000 be spent for Inbor. thereby greatly relieving unemployment. 2. This station can be built without spending a dollar of public money and without adding a dollar to the taxes of the people of Chicago. On the contrary it will actually increase revenues and thereby, perhaps, make it possible to reduce taxes somewhat.” This increased city revenue will come through transforming a large and close-in district, which for years has been blighted because Its natural development has been regarded by adjacent railroad occupancy, into one of the highest type of development, part and parcel of the loop itself. 3. The proposed station will require a minimum of capital expenditure by the railroads. In fact it should mean the return to them of a considerable part ot the capital outlay already made for existing terminal facilities. The Illinois Central Is under contract with the City of Chicngo to build a new station at Roosevelt road large enough to accommodate all the other roads. The Randolph street terminal will not cost any more than the Roosevelt road station; thus it will not in. crease the capital expenditure of this particular railroad. Further, the expenditure made by the Illinois Central in building this station will be offset In two ways; first by the rentals received from the other roads using the system: second, by increasing the value of the realty by making possible and bringing to early realization the development of air rights throughout the remainder of the Illinois Central’s 85 acre area. Thus the suggested terminal should prove a splendid financial investment for the Illinois Central. A proper charge per car made for station use by other railroads should not only reduce present station costs for all the other roads, but the freeing of their present passenger terminal for other uses should far more than offset the cost of renting space in the Randolph station, either by a major reduction in their present capital outlay through the of thelr present station properties or through the rent received from the commercial use of such station areas. 4. The new station would not increase the annual tax of any railroad involved, but would decrease taxes for all roads except the Illinois Central. That road has a provision in its charter that its annual tax shall amount to 7 per cent of its gross revenue. The tax on a new station would be no greater than on its present depot. If the other roads build now terminals of their own, their tax on such development would be increased just as was the ease with the Union station on Canal street. If they use a station constructed en Illinois Central property, they pay no tax on their terminal. Therefore this saving in taxes means a substantial benefit to them. 5. The Randolph street site is in intimate contact with the hotel and shopping districts, and actually more centrally located with respect to the heart of the business district than any of the terminals now occupied by the south side railroads. It has street access unequaled elsewhere. Uninterrupted traffic movement on the front superhighways, Sheridan road, nnd Outer drive along the south shore, is supplemented by widened La Salle street and South Park Way, while east and west access is possible by way of widened Wacker drive without the necessity of traversing crowded loop streets. Street car and elevated railroad transportation facilities are nearby, and will be made even more convenient hy the underground pas- sage suggested as part of the general scheme. 6. There ean be no denying the fact that presence of the railroad stations in the area bounded by Roosevelt road, Van Buren street, State street, and the Chicago river has prevented the natural development of the entire southern portion of the loop district. Removing the several passenger stations, and restricting the freight areas to south of Roosevelt road would remove this blight and permit this district to grow and develop normally, to the tremendous benefit of the city as a whole and the gain of the property owners throughout the entire section. 7. This would have the further effect of making it easier and very cheaper for the city to open Market, Franklin, Wells, La Salle, and Dearborn streets through this district and on through the railroad freight area south of Roosevelt road. North of Roosevelt road these streets should be opened at the normal street level, which is not only much less costly, but also much better from the standpoint of street traffic and adjacent building development. It should stimulate the opening of these streets through the area now absorbed by railroad occupancy, and nothing of greater benefit for that section of the city could possibly be done than removing the present railroad blight and giving the district adequate and access to the remainder of Chicago, both of which betterments will greatly stimulate high class building development all the way from the lake to the river and from the present southern boundary of the loop at least to Roosevelt road. GROUND PLAN OF THE RANDOLPH STREET DEVELOPMENT announced by James Simpson, chairman of the Chicago Plan Commission and designed by Ernest R. Graham, of Graham., Anderson, Probst and White, architect and member of the commission. The shaded shapes eut of Michigan avenue indicate the proposed buildings in this area, the darkest-toned of the s e marking the site of the fifty story passenger wrminal. It is planned to connect all buildings in this district by means of bridges at their tenth or twelfth floor levels. 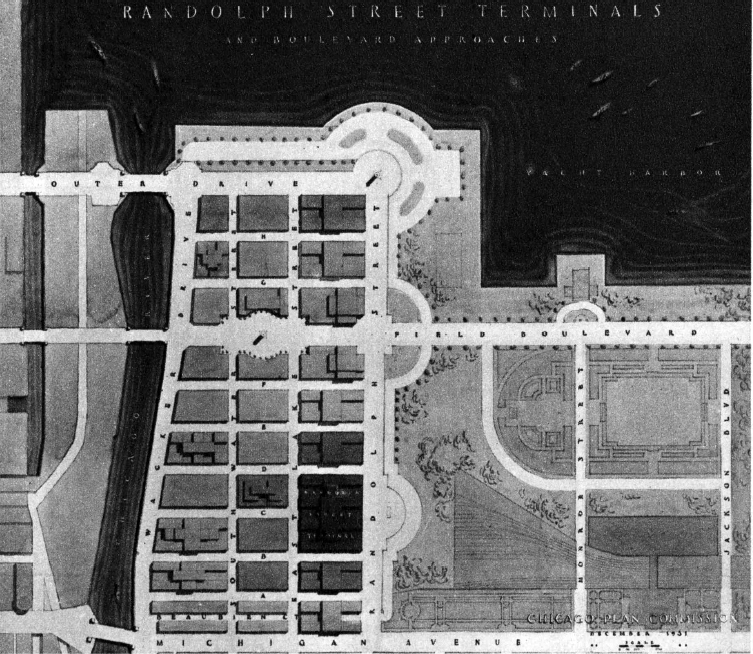 In 1908 the plan of Chicago suggested a series of terminals along the west side of Canal street and the south side of Roosevelt road. The Chicago and North western railroad and the Union sta- group of railroads have new depots along Canal street. The group fronting on Roosevelt road, however, but a dream. The South side terminal situation is at a standstill, and it Is apparent that it is folly to cling longer to a faint hope that sometime, somehow the suggested Roosevelt road terminal will become a reality. And until the terminal is decided there is little prospect of getting streets opened through the south side railroad area. During the Union station negotiation of 1914 the Chicago plan commission to the best of its ability endeavored to persuade the Union station to move their proposed new station back to Roosevelt road. Thre railroads would not agree to this location, primarily because they felt that road was so far from the business center that they would lose a great deal of their passenger business to their competitors. 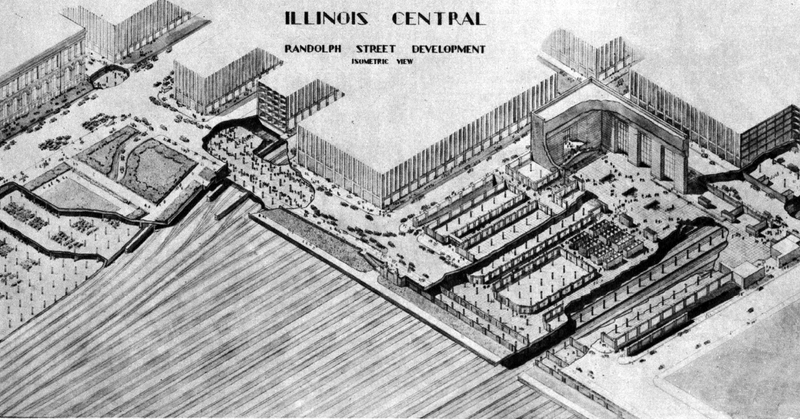 During the Illinois Central terminal negotiations of 1919, the city hald in mind consolidating all the south side railroads In the proposed new Illinois Central depot on the lake front at Roosevelt road got the last thirteen years the Illinois Central has been trying, without success, to induce the thirteen other roads using the Dearborn, VaRn Buren, Harrison street stations Io in with them. Two other factors of great importance have also had considerable bearing on the of new terminal development. One Is the enormous capital investment required. The Chicago and North Western depot cost $20,000,000; the Union station $75,000,000; and the estimated cost of the Roosevelt road Illinois Central depot, Including electrification, etc., amounts to the total of $88,000,000. The other factor is the increased tax burden resulting from a new terminal. The Union station tax, it is understood, was increased by over a million dollars a year for the new station over the old one. From time to time during the last two decades people have suggested the possibility of building a new passenger terminal at Randolph street, east of Michigan avenue, to house all 15 south side roads now using four south side depots. Until recently a number of these railroads did a considerable suburban passenger business, and it was generally believed that the narrow right of way of the Ilinois Central along Grant park was not sufficient to care for the suburban and through passenger business of these 15 railroads. Today, however, conditions are materially changed. No longer do the railroads do such a tremendous volume of suburban business. Even the volume of through passenger business had declined materially. Other changes in railroad operation have come about. Air rights development over railroad tracks has become a reality. The Outer drive along the south side lake front has been built and its connection with the Lake Shore drive on the north side is under construction. A widened Randolph street viaduct east of Michigan avenue has been designed and the cost of its construction has been financed. An easement has been given to the city for a wide Wacker drive east of Michigan avenue and other streets have been provided For in this district. Now, studies indicate, the narrowest portion of the Illinois Central right of way is more than ample to accommodate all the through passenger trains and all the suburban trains of the fifteen south side railroads, with sufficient additional capacity in reserve to care for all the future expansion that reasonably can be anticipated. In the course of its twenty years’ history many of the great plans of the commission and its founders have developed from the dream stage to actuality. The lake front development is one, Michigan boulevard is another. The river straightening is now completed and the outer drive is approaching completion. Wacker drive is an example of what happens when a goal is presented and the public consciousness reaches the decision that the time has come to reach that goal. The Randolph street terminal and all Its possible development in adjacent territory is the new goal now set up. Its backers have complete faith in it and see no for doubt that this new growth will be needed. They are looking beyond the present mood of the people. Mr, Graham has figured the cost at $16,200,000 for the building and $10,000,000 valuation on the land, on a rental basis of $10 a square foot. Its bearing on will be important, as it is hoped to have the trains pulled in and out by electric engines, as in New York. This would be subject to the requirements of each road, as it comes into the terminal at different points. The nearest southern connection would be at i6th street. The stimulation of growth in tile district is seen in the estimate of Mr. Graham that 200,000 persons a day would pass in and out of the station. As an extension of the terminal facilities a great underground development is being planned, Including an excavation that would take care of 4,000 parked cars. “The terminal building would be an imposing structure. The area of the two blocks it would occupy is 175,000 square feet. The station facilities would be on one level—that of the mezzanine between the track level and upper street level. This arrangement locates all the terminal facilities as close to the trains and platforms as possible. “The concourse, which will be a room of 130 feet by 400 feet and almost 100 feet high, is located at the north end of the building. Opening from it would be ticket office, baggage checking, parcel checking, waiting rooms, restaurants and all the various conveniences and concessions which go along with a great terminal.